The Shamokin Youth Girls Basketball League (SYGBL) held its annual Easter party at the Shamokin Annex on Sunday. The league has 92 girls in grades two through nine from various schools. The players were treated to pizza and drinks. About 200 prizes, including four bicycles, two TVs, gift certificates and Easter baskets, were also handed out. League director Robert Getchey thanked the numerous individuals and businesses who donated towards the annual party. Berlin’s Alexis Yanosky is defended by Lourdes’ Katie Sandri (20) and Sierra Coleman (21) during Friday’s state championship game in Hershey. Members of the Mount Carmel Area High School boys track and field team run laps during a practice last week at the Silver Bowl. Members of the Mount Carmel Area High School track and field team work on putting the shot during a practice last week at the Silver Bowl. Members of the Mount Carmel Area High School track and field team work on baton handoffs during a practice last week at the Silver Bowl. Due to poor weather, the Shamokin Area High School baseball team works indoors last week at the high school. Wolfgang Pearson, a member of the Shamokin Area High School boys track and field team, works on his speed during an indoor practice last week at the high school. Senior Lilly Bickel is spotlighted during player introductions during Friday’s PIAA Girls Class 1A State Championship Game in Hershey. 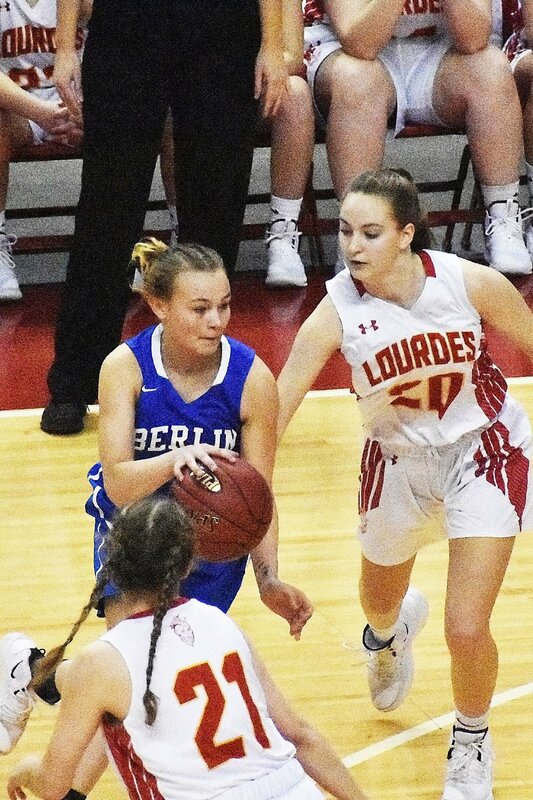 Lilly Bickel makes a strong effort to go up for her shot while surrounded by Berlin defenders during Friday’s state championship game at the Giant Center in Hershey. The Lady Red Raiders basketball team sits waiting to take the court before Friday's PIAA Class 1A Girls Basketball Championship Game at the Giant Center in Hershey. With her coach and teammates looking on, Sierra Coleman takes a deep shot from behind the 3-point line during state championship game action Friday afternoon at the Giant Center in Hershey. With his team huddled around him, Lourdes coach Mike Klembara talks strategy during a timeout in Friday's state championship game at Hershey.